Giancarlo Esposito is originally from Denmark; his father was Italian and his mother was African-American. He's an urbane and fastidious actor, whom I have liked for a long time. He played the lead in a short-lived comedy series called Bakersfield PD, which I loved, and he's been in several Spike Lee films etc. In Breaking Bad he plays Gus Fring, the drug boss of Albuquerque. In the last couple of seasons he has been implicitly dangerous, but buttoned up, like this. But in Sunday's episode - Box Cutter - he was Like This. Gus: Well, get back to work. That's all he said in forty five minutes. And the killing - see the link above - was so enigmatic and extreme. It took ages. And all the time Gus was staring at Walt, and then Jesse. On and on, staring into Jesse's eyes as the man bled to death. Why did he do it? He did it to show that he was totally stone cold. And I think he did it to win over Jesse. It was a sort of evil seduction. Jesse has an instinct to submit to the most powerful person, and Gus showed he was that person. And Jesse did respond to it (unlike Walt who was repelled). But why would Gus even want Jesse? As far as I can tell Gus is 'immune to Jesse's boyish charms'. Gus thinks Jesse is an unreliable junkie, who won't obey. I think the clue is that he performs this killing a few moments after Walt has said 'If you kill Jesse you don't have me.' So what Gus does is to take Jesse from Walt, in order to punish him and control him. I think that is what is going to happen over the next few episodes. I think Gus and Walt will struggle for Jesse. For his soul really. In Season 2 Jesse showed Jane his superhero drawings. One was 'Joey', a superhero who is very small and rides around in Kanga-Man's pouch: 'Together they Fight Crime'. How bloody odd is that? 'Joey' is obviously the alter-ego of Jesse. And Kanga Man? That's this total fusion of male and female dominance archetypes. It's like super father/mother. Jesse wants to be in partnership with a Kanga-Man who will protect him, and carry him into adventure. His other cartoon was 'Doctor Chemistry' - the icon of this post - which is obviously Walt with a massive phallic gun. I think Walt and Kanga-Man are too closely linked in Jesse's messed up heart for him to fall completely under Gus's spell. I think this psychology is more complex and daring than we normally get in TV programs. And it does make sense, makes sense going back two years or more. I am getting away from Giancarlo Esposito now. But all of this depends on three actors performing at their career-best level, and in Box Cutter - Breaking Bad 4.1 - you can see them hitting every note spot on. Great post! I like the analysis of Jesse's super-hero drawings, particularly; not many people key into their potential significance. Giancarlo rocked episode one. You just know there's a mind-blowing season ahead. I hope when Mike said 'you won't see Gus again' he didn't mean it. Yeah, hopefully it's just Walt that doesn't see Gus again. I mean, it's safe to assume that he won't be going over to his house for dinner anymore, heh. I'm glad I'm not the only one who spotted a special connection between Gus and Jesse in the premiere. It looked like Walt was the excluded one. The one who didn't realize what was actually happening. It's Jesse who's on the same page as Gus now. Will he hate it or like it? And the "You kill Jesse you don't have me" comment, God, what a naive thing to say, just openly admitting your affective attachment to the boy, your inconvenient weakness. 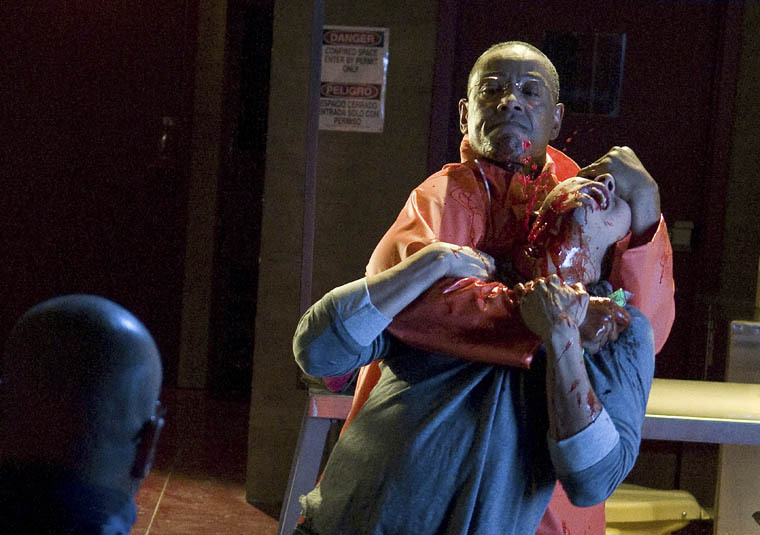 Walt offered Gus the perfect weapon for hurting him deeply. And Walt showed he really believed in his relationship to Jesse, that means, he will be sorely disappointed, if not betrayed. Gus will do whatever he can to take the boy from him. "Divide et impera", Latins would say. Yes, when Jesse casually imitates Gus's throat-cutting action in the restaurant as they have breakfast, he shows that he is falling under Gus's spell I think. Though obviously he's nowhere near as blasé about it as he acts. The more distant Gus is, the more powerful he seems. He's assuming some sort of "Kaiser Soze" mithological aurea, nurturing Walt's fear -and anger- more and more. On the other hand Walt, the wannabe Alpha Male who takes Jesse's respect for granted without bothering to return it, has shown in front of the boy that he's still pretty much the underdog when the fight gets tough. Jesse has already shown to be ready to reluctantly dismiss him once he finds a better "caretaker". It's not about feelings, it's about needs. I don't think this is what Jesse really is like, but Walt has reduced a caring, passionate boy to a brutalized survivor. Didn't Walt insult him for not doing what's convenient? Jesse may now show him he's learnt the lesson. Can't say Mr White doesn't deserve it. Tragic thing is, Walt truly feels for Jesse. But I think it's too late. It was heart-breaking on Sunday. Jesse even asked Walt more or less on a date, and Walt can't unfreeze enough to even respond. If you are interested in Breakign Bad there is an lj-community which discusses each episode. Here is the post for 'Open House'. Thanks for inviting me! Yes I definitely need a place to share my sorrow for Jesse and my disgust for Walt. Their scene together in the last episode looked too much like a "goodbye to Walt&Jesse". By the way, I don't think I will be able to bear Aaron's acting much longer. It's really starting to hurt me inside, almost phisically.